Belly Up Aspen was opened by owner Michael Goldberg in January 2005, two years after his brother Steve acquired the original Belly Up in Solana Beach, CA. Continuing the tradition of a family run business, Michael now owns the club with two of his sons, David and Danny Goldberg. Listed as one of Rolling Stone Magazine's "BEST CLUBS IN AMERICA," Belly Up Aspen is a 450-capacity music venue at the base of Aspen Mountain. 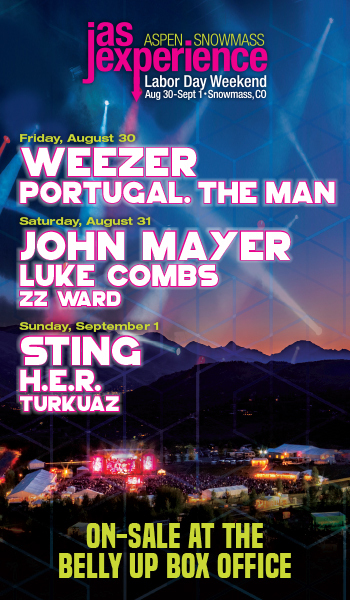 Presenting 300+ live concerts a year, Belly Up Aspen has featured musical talents such as LCD Soundsystem, The Killers, Widespread Panic, The Chainsmokers, Jack White, Lil Wayne, The Avett Brothers, Joe Walsh, John Legend, Snoop Dogg, Bassnectar, B.B. King, Phoenix, Twenty One Pilots, The National, Kygo, Justice and Jimmy Buffet. We do not take ticket transfer requests over the phone but you can email your request to boxoffice@bellyupaspen.com. What is your policy on ticket limits and ticket resale? We impose ticket limits on all Belly Up performances. Typically, our limits are a 4-ticket limit for GA OR a 6-ticket limit for RESERVED per customer, credit card or email address. Orders exceeding these limits, or any tickets purchased for resale, may have a portion or all of their orders cancelled without notice. Limits for each show are listed on the show purchase page. When does your box office open? During the Summer and Winter high seasons Belly Up Aspen box office is open 7 days a week from 2pm to end of show. 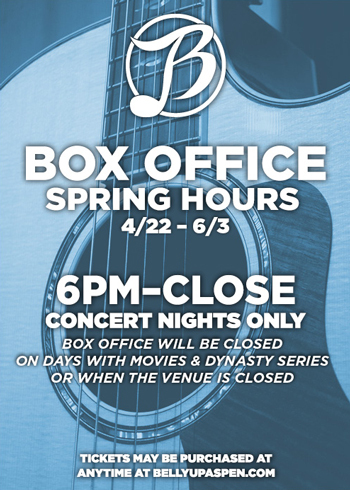 If there is not a show, the box office typically closes at 6 PM. Feel free to call (970) 544-9800 or check out our calendar, to confirm hours for that day. Tickets are available 24/7 at bellyupaspen.com. How can I contact the Belly Up, Aspen? You can reach the Box Office for general information at (970) 544-9800 or by emailing boxofficemanager@bellyupaspen.com. What Constitutes a "Valid Photo ID?" I’m not from the United States… What if I don’t have a US Government Issued ID? The surest way to prove you are of legal drinking age/meet specific age restrictions is to bring your passport. 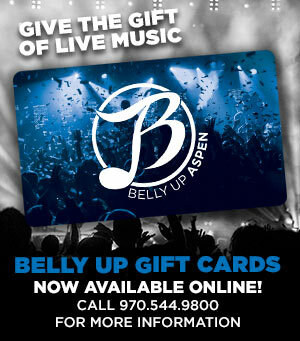 How can I get tickets to Belly Up Aspen shows? 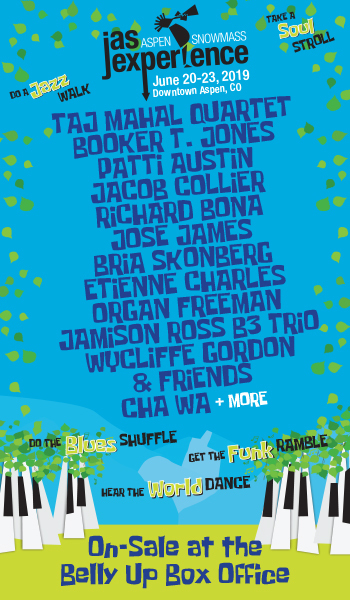 Tickets are always available online at www.bellyupaspen.com. Tickets can also be purchased at Belly Up box office and via phone during box office hours. Service fees are collected for phone orders and online transactions. Fees are waived at our box office. Please note that our high demand shows sell out quickly. We cannot guarantee that tickets will still be available when our box office opens. Be wary of buying tickets from any third party website. Belly Up Aspen can only guarantee tickets purchased through Belly Up Aspen’s Box Office and through bellyupaspen.com. Patrons purchasing tickets through third-party ticket brokers or individuals reselling their tickets, assume full risk for potentially fraudulent tickets purchased or obtained through unauthorized vendors. Belly Up Aspen has no way of validating or replacing tickets that were not purchased through us directly. We cannot reprint or refund you for an invalid ticket. Lost, torn, tampered or altered wristbands will not be honored. The majority of our shows have DELAYED DELIVERY for DIGITIAL TICKETS. Digital Delivery tickets will be emailed to the address you provided typically 1-2 weeks prior to the show date. This gives us the ability to monitor for purchases which may not adhere to our ticket policies. Orders exceeding ticket limits, or any tickets purchased for resale, may have a portion or all of their orders cancelled without notice. You will receive an individual email for each ticket purchased with your ticket attached. Each ticket must be readily available on your phone or printed and brought to the event. What is seating like at the Belly Up Aspen? Belly Up Aspen is a general admission venue with an 80-person seated reserved section. When a show is GA only the entire room is first-come, first-served. Most of our big shows have a GA ticket and a RESERVED ticket (which guarantees you a seat in the RES section). The reserved section consists of 11 tables (seating 4-6 people at each table) and railing seats on the second tier of the venue above the dance floor. There is also limited fixed seating that is available on a first-come, first-serve basis in GA. Please do not save seats in our General Admission section – make sure your entire party is present before finding a place to sit in GA.
How do I reserve a table during a general admission show? FOR GA ONLY SHOWS You can reserve a table by contacting our box office at 970-544-9800. There are a limited amount of tables IN OUR RESERVED SECTION available and reservations start at $250 food/beverage minimum during a GA show. Pricing may vary based upon the show. We do offer bottle service at these tables. Gratuity is not included in the table minimum. Table reservations are non-refundable. If you “no-show” we will charge the set minimum. TABLE MINIMUMS DO NOT INCLUDE THE PRICE OF A TICKET. We usually open doors 1 hour before the start of a show. Remember that’s a “usually,” not an “always.” Always check your ticket, our website, or call box office to confirm doors. Door and show times vary depending on the night’s line-up (how many opening acts there are, genre, what day of the week it is, etc.). Check our website calendar or your ticket face to find the time for a particular show. How many people can the Belly Up Aspen hold? Belly Up Aspen capacity is 450 for all shows unless it’s a seated show (325 capacity). GA shows have limited fixed seating available on a “first-come, first-served” basis. Is the Belly Up Aspen handicapped accessible? Yes, Belly Up Aspen is a handicapped accessible facility. If you need special assistance please contact box office in advance or contact Manager@bellyupaspen.com. Please be aware that there are a limited number of accessible seats at Belly Up Aspen. If you need special accommodations, the best practice is to contact the box office, purchase your tickets and submit your ADA request. Are there any special effects used? Depending on the show the following effects may be used: strobes, confetti, lasers and/or cryo. Are food and beverages available at the Belly Up Aspen? Yes. Our kitchen offers sandwiches, burgers (all natural beef and the plant-based Impossible Burger) small plates and a variety of other bar food with vegetarian options available. Belly Up Aspen also has two full bars for your enjoyment. If you, or someone in your party finds themselves slightly impaired due to the consumption of alcohol, Belly Up Aspen participates in a free cab service called Tipsy Taxi. Just let a member of our staff know that you would like our assistance. Is there an ATM located inside of the Belly Up Aspen? Yes, there is an ATM. It is across from the main bar. When you enter the front doors, the ATM is located left along the wall, just after the coat check room. We offer coat check seasonally during the colder months via two coat check rooms to the left of the box office. We also offer coat check through the box office year-round. Does the Belly Up Aspen allow audio and video taping? What about cameras? We do not allow video cameras. We do not allow audio taping unless the artist approves. We do not allow still cameras unless the artist approves, and when approved, flashes are not allowed they distract the artists and disrupt other patrons’ experience. What can’t you bring into the Belly Up Aspen? We do not allow: weapons of any kind, illegal substances, mace, props, outside food or drinks, backpacks or other large bags. We want you to have an enjoyable evening. We take security very seriously. If you have any problems, please contact a member of our staff for assistance. Belly Up Aspen, per the terms and conditions of purchase, does not offer refunds or exchanges. All sales are final. Belly Up Aspen is entitled to retain all fees collected for services that it performs in taking orders and delivering tickets, including shipping, handling and service charges. Please treat your tickets like cash. Any lost or stolen tickets will not be replaced.